Are you local to Md and need a dog sitter for your puppy or older Labradoodle? Reach out to Julia Mills for more information on pricing and availability! Julia and her husband Nick live in an apartment in Laurel, MD with their Eden Valley labradoodles Honey & Pippi. Pippi is one of our retired breeding girls and Honey is her daughter who will be joining our breeding program! Honey especially LOVES to play with other dogs! Your dog would spend mornings and evenings in Laurel with us and spend the work day at Eden Valley running around on their fenced 5 acres of land playing with the other dogs! We work on training with Honey & Pippi often and would be happy to assist in continuing the training of your pup while they are with us if you have any requests. We typically practice Honey’s tricks in the evening with a short training session. Because we live in an apartment your pup, Pippi, and Honey would go on many walks together practicing leash work also if needed! We hate leaving Honey somewhere that lets her get away with anything because we always have to retrain her when she comes home! Email Julia at Julia.edenvalley@gmail.com for more information! Do you really want one of our puppies but the timing just isn’t right for our puppy pick up & puppy 101 class? 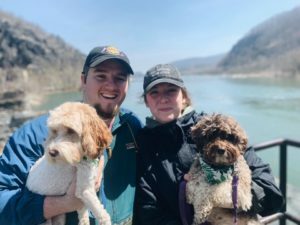 Julia, one of Eden Valley’s own, and her husband Nick offer a puppy delivery service that also includes a personal puppy 101 class! This service does come with extra fees that fluctuate according to where you live.